It is rare the launch of a novel by an unknown writer generates the attention and publicity of The Passage, rare in these days of digital media and celebrity tell-alls that a publisher will have the resources and inclination to support any novel, let alone a niche genre hardback, but on this occasion, hype and expense are fully justified. 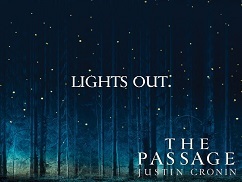 The Passage is a work of rare and exquisite beauty and construction, the horror novel as literature. From the opening pages, the world we are immersed in is real, every pain and tragedy and disappointment and dashed hope laid out in terrible and inevitable detail. This is the story of Amy, abandoned by her mother not through lack of love, but in the genuine hope that leaving her in the care of others might give her a better life, and the story of all those who she touches, each stop along her passage through the next century – Sister Lacey, the nun who takes her in, Brad Wolgast, the FBI agent sent to retrieve her, and Peter Jaxon, who stands the night watch at what might be the last outpost of humanity. Each has their own tragic story, fighting for survival in an ever more hostile world, where the only thing to cling to is hope itself. Some of their stories are told from a distance, in an email exchange between a university professor and his colleague on a South American jungle expedition, beset by nocturnal attacks, the messages increasingly erratic and disturbed, concluding with the chillingly simple and direct “Now I know why the soldiers are here;” in flashback, in a recollection of a late night evacuation of a city about to be overrun, and the horror that overtook the train full of children, leaving a sole carriage of survivors; and in the arriving present, the daily life of the last colony of humans, huddled under the lights that are their only defence against the ever present terror that hides in the night, the virals – fast, vicious, powerful and nearly unstoppable. The Passage is not an easy book to read. It is slow, pensive, brooding, and unrelentingly grim, with dread and trepidation on every one of its near eight hundred pages, but each word is also written with precise and clear beauty, the lives and expressions and torment of each person who has managed to survive this dying world, from the desert sands of California across to the ice chilled rivers of the mountains of Colorado where the secrets of the past may lie. Even the dreams of those who have not yet been taken up are infected by smoke, blood and knives, the dreams of the Twelve, original test subjects, now immortal, their progeny spread across the land. After the long, moody preamble, set in a near but recognisable future, the careful scene setting and building of character and history, when the violence unfolds it does so swiftly, brutally, shockingly, and with unmerciful finality. And through it all is Amy, the eternal child who has witnessed firsthand the fall of an entire civilisation, a fixture in time whose life was written before she was born, taking each step towards her destiny as though she can see the future laid out in front of her, Amy who can communicate with humans, virals, horses, even polar bears. From the opening line, the novel belongs to her; even when she is not present, even when the characters do not even know of her existence, they dream of her, and she of them. While a new and modern take on the vampire novel, there are echoes of the grand past of horror – during a break in their journey, the characters view an old copy of the Bela Lugosi Dracula, and the travels recall the passage across Europe in Frankenstein, although with more incident, and while the vast ensemble of characters recalls the best of Stephen King, in particular ‘Salem’s Lot, we are fortunate that these bloodfeasters avoid the sun because it kills them rather than making them twinkle. Cronin is striking in his use of language, both in the words that are used, and those that are avoided. The Passage, while peripherally describing the plot, is not a word featured in the text until very late, then several times more in succeeding pages. First, as Alicia performs the mercy on an infected soldier before the transformation takes hold: “his life left him and he slumped forward, Alicia receiving him in her arms to ease his body’s passage to the muddy ground,” hints that the passage itself refers to the certainty and ugliness of death, but the next usage does describe a physical passage, the way under the mountain to the military base beneath. Then only pages later, it is indicated again that the passage is death, but that it is Amy who will take the Twelve on that trip – or is it the passage between human and becoming half viral immortal, in the way that Amy has?